Box Text: In this brand new standalone experience, Alan Wake fights the herald of darkness, the evil Mr. Scratch! A thrilling new storyline, hordes of creepy enemies, serious firepower and beautiful Arizona locations, combined with a fun and challenging new game mode make this a must for Alan Wake veterans, and the perfect jumping on point for new players! Play the full-fledged Story Mode, and youâ€™ll be on the edge of your seat as you fight to stop your murderous evil double to take back your life... and change reality itself! But thereâ€™s more to this nightmare â€“ in the action-packed Arcade Mode, youâ€™ll need to master the Fight with Light mechanic to stay alive until dawn and beat your friends on the Leaderboards. Can you survive until sunrise? 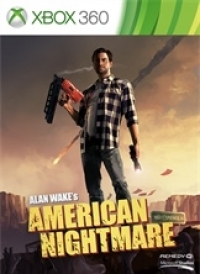 This is a list of VGCollect users who have Alan Wake's American Nightmare in their Collection. This is a list of VGCollect users who have Alan Wake's American Nightmare in their Sell List. This is a list of VGCollect users who have Alan Wake's American Nightmare in their Wish List.